Choosing the right Node.js Framework: Express, Koa, or Hapi? Node.js was first introduced 10 years ago, and in that period of time, has become the fastest-growing open source project on Earth, with +59,000 stars on GitHub and more than a billion downloads. In this article, we will explore the differences between three of the most popular frameworks in Node.js: Express, Koa, and Hapi. In a future post, we will look into Next, Nuxt and Nest. Express is a minimal and flexible Node.js web application framework that provides a robust set of features for web and mobile applications, it behaves like a middleware to help manage servers and routes. For every other path, the server will respond with 404 Not Found. Almost the standard for Node.js web middleware. Simple, minimalistic, flexible and scalable. Easy integration of third-party services and middleware. Although Express.js is a very convenient and easy-to-use framework, it has some minor drawbacks that may influence the development process. Organization needs to be very clear to avoid problems when maintaining the code. As your codebase size increases, refactoring becomes very challenging. A lot of manual labor is required, since you need to create all endpoints. Express provides a thin layer of fundamental web application features, without obscuring Node.js features that are familiar. Do logging correctly (for debugging, use a special module like debug, for app activity use winston or bunyan). Handle exceptions properly, using try-catch or promises. Ensure your app automatically restarts by using a process manager or use an init system like systemd or upstart. Run your app in a cluster. You can increase the performance of a Node.js app greatly by launching a cluster of processes (a cluster runs multiple instances of the app, distributing the load and tasks among the instances). Cache request results, so that your app does not repeat the operation to serve the same request repeatedly. Use a load balancer to run multiple instances of it and distribute the traffic, like Nginx or HAProxy. Use a reverse proxy that performs supporting operations on the requests. It can handle error pages, compression, caching, serving files, and load balancing among other things. You can find a list of security updates in Express in the following link. Node.js vulnerabilities directly affect Express, so is important to keep an eye on Node.js vulnerabilities and make sure you are using the latest stable version of Node.js. The Express community meets regularly, and they communicate through their mailing list, Gitter, IRC channel, issues in GitHub, and the Express Wiki. Finally, express is probably the most popular framework for Node.js, and there are many other popular frameworks that are built on Express. 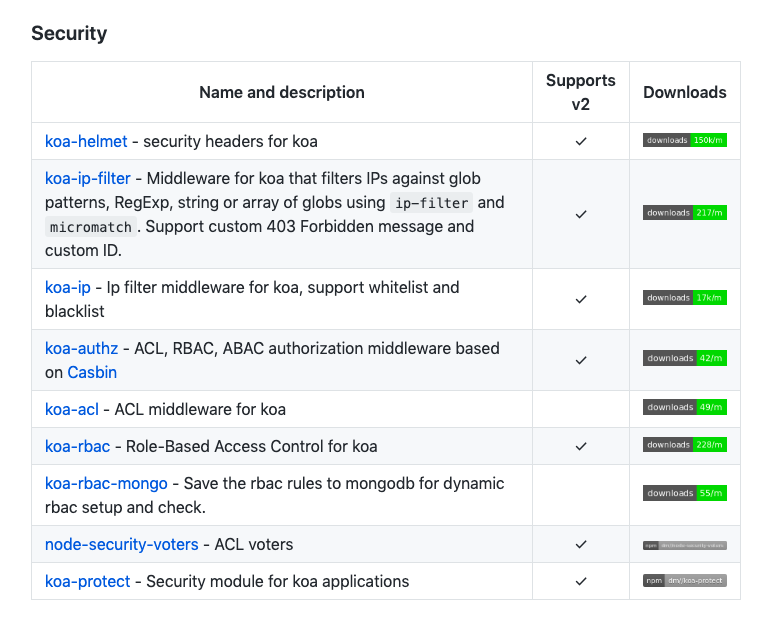 Koa was built by the same team behind Express, and aims to be a smaller, more expressive, and more robust foundation for web applications and APIs. By leveraging async functions, Koa allows you to ditch callbacks and significantly increase error-handling. Koa does not bundle any middleware within its core, and it provides an elegant suite of methods that make writing servers fast and enjoyable. A Koa application is an object containing an array of middleware functions which are composed and executed in a stack-like manner upon request. Koa requires node v7.6.0 or higher for ES2015 and async function support. You need to have already installed Node.js. This is the most basic example of a “Hello World!” app on Koa that listens on the port 3000. Koa improves interoperability, robustness, and makes writing middleware much more enjoyable. Has a large number of helpful methods but maintains a small footprint, as no middleware are bundled. Koa is very lightweight, with just 550 lines of code. Has a very good user experience. Better error handling through try/catch. No more callbacks, facilitating an upstream and downstream flow of control. Cleaner, more readable async code. The open source community around Koa is relatively small. Not compatible with Express-style middleware. With Koa.js you can build web apps with great performance. This is because you can stop using callbacks, deal with errors faster, and because Koa itself is a very lightweight framework. As well as that, it makes the code management process easier. It’s important to take into account the best practices for having a better performance in Node.js like running things in parallel, use asynchronous APIs in your code, keeping code small and light, and using gzip compression. You can join G+ koa Community, mailing list, contribute to Koa’s repo, join koa slack or start a discussion in hashnode. Hapi is a rich framework for building applications and services. It enables developers to focus on writing reusable application logic instead of spending time building infrastructure. It is a configuration-driven pattern, traditionally modeled to control web server operations. A unique feature Hapi has is the ability to create a server on a specific IP, with features like the onPreHandler, we can do something with a request before it is completed by intercepting it and doing some pre-processing on the request. To save it to your package.json dependencies. Then you just launch the application by running npm start and open localhost:8000/hello in your browser. It provides a robust plugin system that allows you to add new features and fix bugs at a fast pace. It enables you to build scalable APIs. It is an excellent choice for building Representational State Transfer (REST) APIs because it provides you with routing, input, output validation, and caching. You can build an API that serves all kinds of clients that need mobile and single-page applications. Detailed API reference and good support for document generation. You can use hapi.js with any front-end framework, like React, Angular, and Vue.js to create a single-page application. Provides really good enterprise plugins such as joi, yar, catbox, boom, tv, and travelogue. Developers need to figure out the code structure on their own. “Locks” developers into using hapi-specific modules and plugins such as catbox, joi, boom, tv, good, travelogue, and yar; and which are not compatible with Express/Connect. Endpoints are created manually and must be tested manually. 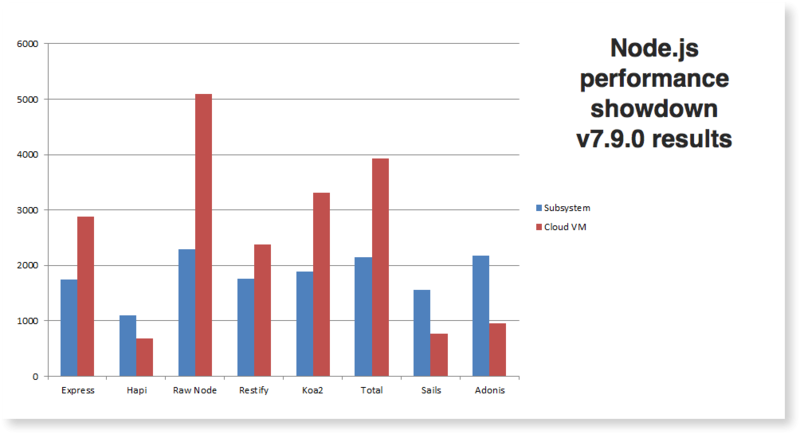 A 2017 study on Node.js frameworks, showed that hapi performed the worst compared to the other frameworks. 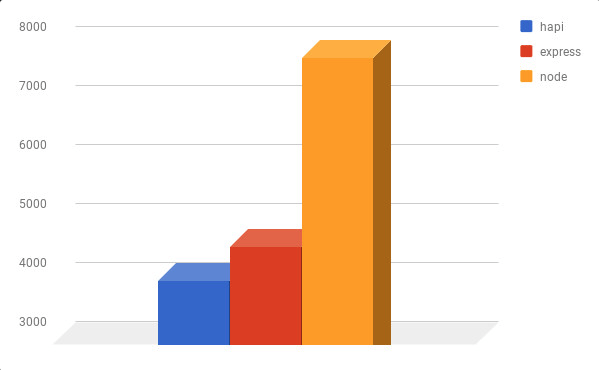 As we can see in the following graph compared to express. This test is consistent with past results. Express continues to maintain a performance edge over hapi. Applications with significant performance requirements should consider the advantage Express has over Hapi. Crumb: Anti cross-site-request-forgery (XCSRF) token generation and validation plugin. It works both with regular requests and CORS requests (OWASP recommends using CSRF protection, such as Crumb, along with CORS). Synopsys recommends using Crumb v3.0.0 or newer since a CSRF token leakage issue has been fixed when using Crumb with CORS enabled and the request origin does not match those specified in the CORS configuration. Hapi-rbac: Allows developers to implement role-based access controls easily. Broad enough to grant or deny access to entire groups; granular enough to grant or deny access to individual users. Blankie: Allows developers to set the Content-Security-Policy header directives easily. The CSP is flexible enough that it may be implemented on a per route basis or across all routes. Cryptiles: Provides general purpose cryptographic utilities for random number generation, encryption, hashing and fixed-time comparisons of hashes that are based on the Node.js crypto library. You can join slack channel: hapihour.slack.com, visit the community page, community governance page and follow them on twitter to keep updated with the latest news.